I came across this picture twice this week. Earlier this week I was reading Shirley Buxton's blog, writenow.wordpress.com, which I found through apostolicbloggers.blogspot.com a couple of months ago. She had this picture posted and a link to another blog, inhistime.wordpress.com, which told the story behind the cake. I got such a laugh out of it, and it was especially interesting that apparently this cake was made by a Walmart in the Little Rock area where I live. According to the story, it was made for a going-away party for someone at BCBS in Little Rock. Then yesterday I came across this picture again. I was (and still am) housebound due to being sick - fever, achy and all that. I had little energy, so I entertained myself throughout the long day by reading blogs. One of my favorite blogs is thepioneerwoman.com. On her site, she mentioned the 2009 bloggies awards. She has been nominated in several categories. So I went to 2009.bloggies.com and voted for her and while I was there I checked out other blogs that had been nominated in various categories. That's where I came across this picture again. If you want to read a funny blog, check out cakewrecks.blogspot.com. 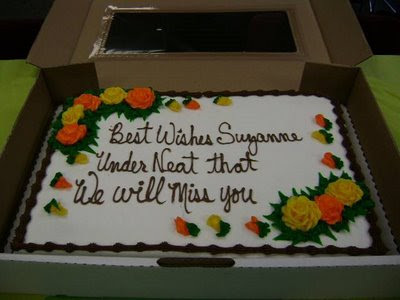 The subtitle is "when professional cakes go horribly, hilariously wrong." And believe me, it is hilarious. Not just the cakes. The accompanying narrative only adds to the humor. Even though I was so sick, I was laughing out loud. I found the picture above on the sidebar under "the cake that started it all." Laughter - it's the best medicine. Lori, you are the sweetest! So many blog posts in my head & so little time lately! More coming soon, I hope. Your comments are definitely an encouragement. I'm looking forward to the book club.